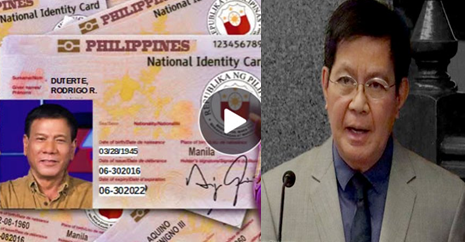 Senator Panfilo Lacson is hoping Congress will finally support a measure seeking to establish a national identification system in the country. “National ID Reference System Act. I can’t remember how many times I’ve filed the bill. I hope the 17th Congress will mind it this time,” Lacson tweeted. Way back in 2008, senator Lacson support for plans to implement a national ID system and urged Malacañang to certify as urgent the national ID bill he filed at the start of the 14th Congress. "A national ID system is a great benefit, with the proper safeguards and the right implementation. If Mrs. Arroyo is serious about having a national ID system benefit the people, she merely has to certify the bill I filed as urgent," Lacson said. "By providing one single code to each and every citizen of the Philippines at birth and a reference card carrying their number, among other information at an age when a person may begin to actively participate in society – we not only help a person integrate himself into our society, but we also simplify any transaction that the person may have with the various agencies of government as well as with private entities," Lacson stated in his bill. "Moreover, the (rise in) criminality and the continuing challenge of terrorism have rendered the need for a national identification system urgent. In the context of efforts to fight criminality, terrorism and lawlessness, the proposed national reference card shall help facilitate the processes of apprehension and prosecution of those who have committed violations of the law," he added. President Rodrigo Duterte earlier said he will leave to Congress to decide on the proposed national ID system in the country.